Since 2010, over 36 elephants have been translocated to the Jahai tribe’s backyard. 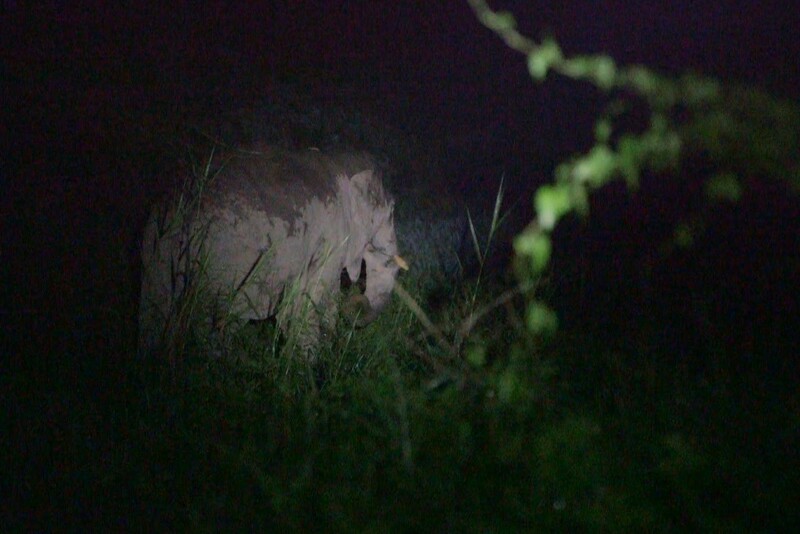 R.AGE faced up to a charging elephant to film their stories. Tagged Cover Story, Documentaries, Royal Belum State Park. IT was late at night, and the jungle was almost pitch black. Our video crew was huddled next to a large tree stump, hoping it would protect us in case we were attacked. For the first time, we found ourselves alone in the jungle, separated in the darkness from our orang asli hosts, who had so kindly agreed to let us stay in their bamboo huts. The son of our host, a young man, ran to our hut to warn us that we were in danger. By the time we gathered our video equipment and got out of the hut, the entire village was in motion. The women and children were boarding a boat to take refuge in the middle of the river. In the darkness, we could hear the men in the jungle, wailing and banging on whatever they could find to make noise. The surrounding villages were doing the same. Flashlights were pointing everywhere, bonfires were lit. And then we spotted it. An elephant, or orang kuat, as the orang asli call them, had wandered into the village. It appeared to be looking for food, and was already chewing on foliage less than 50m from where we were. Though it showed few signs of aggression, the orang asli were tense. They had told us stories of how elephants have killed their people. All we could hope to do was stay out of its way, which wasn’t easy considering how dark everything was. 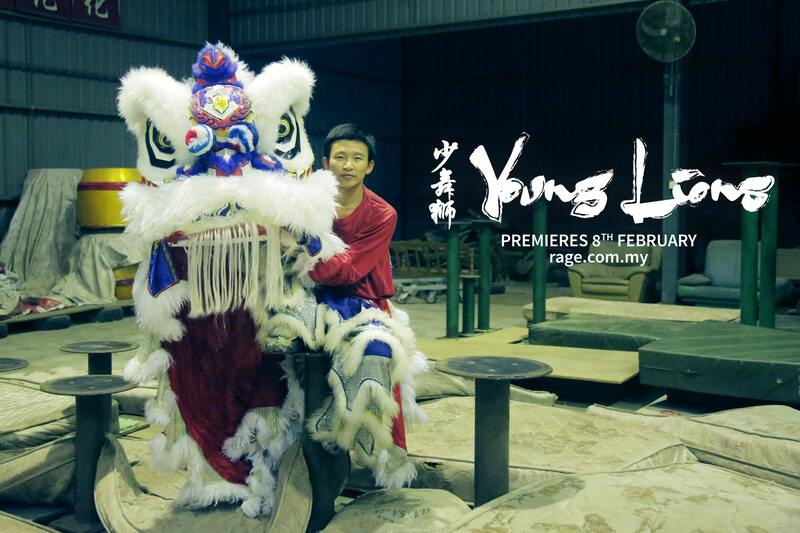 Then, our R.AGE senior producer Elroi Yee then came up with the idea of hiding behind the tree stump. In hindsight, it would have made little difference. It’s hard to comprehend the size and strength of an elephant until you’re face-to-face with one – like we were. 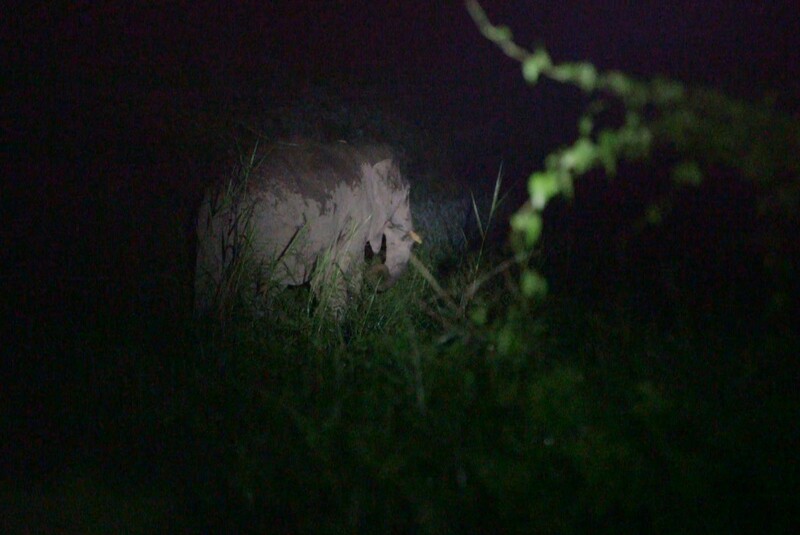 For a few terrifying moments, the elephant charged towards us, before veering away into the darkness, snapping trees down in its wake. The orang asli at the Royal Belum State Park have, unfortunately, become increasingly exposed to the elephants’ destructive force. The Wildlife and National Parks Department (Perhilitan) said as many as 36 elephants have been translocated into the park since 2010, doubling the elephant population there and putting the orang asli – and whatever little crops they grow – in danger. Elephants are usually translocated into jungles whenever they wander into conflict with humans. It’s a logical, if slightly debatable, practice. Sadly, what some fail to realise is that there are humans living in our jungles too. 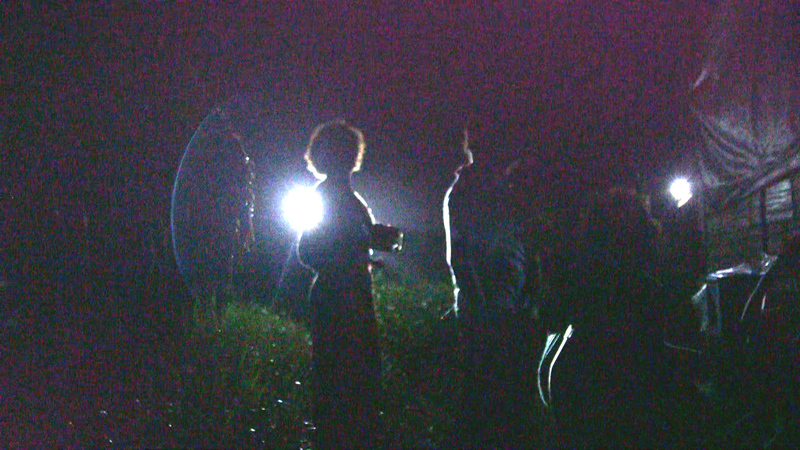 A screengrab from our video of the orang asli trying to scare off an elephant that had wandered into the village. It was pitch black, save for a few torch lights. We will stay in the hills until the elephants leave. They will come back tonight. I’m sure of it. The R.AGE crew was in Sungai Kejar, one of many orang asli settlements in the state park, to investigate claims of an unusually high child mortality rate, which the local Jahai tribe believe is caused by a disease they call serawan. But as we quickly discovered, serawan wasn’t the only problem the orang asli were facing. We had rented a boat to get into Sungai Kejar, and from there, we were all on our own. We had to approach the tribesmen, earn their trust, and ask for a place to stay and a chance to tell their stories. On the first night in the jungle, we heard screams and howls in the distance. It seemed to come from a neighbouring village. We visited the village the following day, only to find it abandoned. The homes were ripped apart, and the villagers’ belongings strewn all over the compound. Turns out, there were two elephants, and they took most of the food the families had stored up. The rest was tossed onto the dirt. We visited seven villages in Sungai Kejar, and at all seven, we encountered similar stories about elephants. The orang asli would grow their crops for months, then lose them all within a night to hungry elephants. Of late, the elephants have become bolder, venturing into houses in search of salt and rice, as in the case of Kederi’s village. Kederi and the 20 or so villagers – which included women and young children – were forced to move up into the hills, where it would be harder for the elephants to reach them. They took little more than the clothes on their backs. “We will stay in the hills until the elephants leave. They will come back tonight, I’m sure of it,” said Kederi. But that wasn’t to be the last we’d hear about the elephants. Later that evening, while we were on our boat heading back to our village, we saw a few elephants swimming across the river, dangerously close to another village. And that very night was when we found ourselves hiding behind that tree stump. 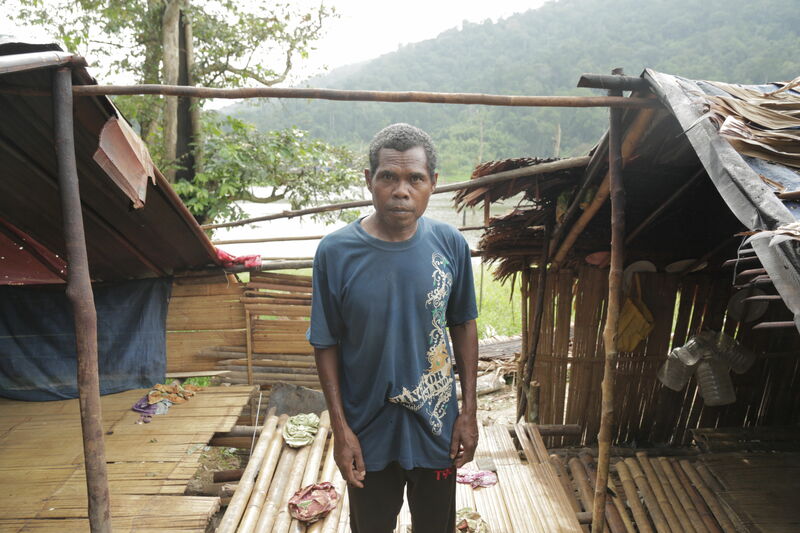 Kederi, an orang asli, standing in the middle of his home, which was torn apart by an elephant. It stuck its trunk into the hut, looking for food. Kederi’s entire village – including women and children – ran into the hills after the ‘attack’. They would stay in makeshift tents like this for several weeks while waiting for the elephants to leave the area. Translocation can be used in some cases, but it needs to be the last resort. So essentially, this isn’t a case of orang asli vs elephants. It’s only happening because someone decided to dump 36 elephants – mostly problematic ones – on the Jahai’s backyard, and left them to deal with the fallout. And that brings us to the issue of translocation. Dr Ahimsa Campos-Arceiz, a Spanish elephant conservationist based in Malaysia, said in the 70s, Malaysians dealt with human-elephant conflict by shooting the elephants. In that sense, translocating the animals into state parks is obviously more humane. But translocation has plenty of downsides too. A University of California study in 2008 showed that mortality rates among translocated elephants in the Tsavo East National Park, Kenya were “significantly higher” than local elephants. More recently, a 2012 study mandated by the Department of Wildlife Conservation Sri Lanka tracked the movements of elephants translocated to national parks in Sri Lanka through GPS collars. It concluded that translocation “causes intensification and broader propagation of human-elephant conflict and increased elephant mortality,” which defeats the entire purpose of translocation. Dr Campos-Arceiz is hesitant to blame translocation for human-elephant conflicts, but admits it is not the best solution. Humans in the jungle, he believes, should learn to protect their crops, be it through building trenches or electrical fences. “Translocation can be used in some cases, but it needs to be the last resort,” said Dr Campos-Arceiz. On top of that, translocated elephants are often thought to be more problematic – perfectly understandable given they’ve been yanked away from their homes. “There is a fair amount of truth there,” added Dr Campos-Arceiz. “The elephant is confused, it’s not in its natural environment. Stuff like crops become a much more attractive resource when you are under stress, and you don’t know where the good feeding grounds are. If we do not receive reports, we cannot take action. Ironically, while elephants are being translocated away from their homes, the Jahai people – traditionally nomadic – are being encouraged to stay put. This makes it easier for them to get aid from the authorities, but it also means they can’t move anywhere else once the vegetation in their area has been depleted, which was kinda how things worked for them way back when. The rations they get from authorities aren’t exactly a balanced diet on their own either – white rice, condensed milk, tea, flour, sugar, cooking oil, Milo and some canned food. So in a way, the orang asli and elephants are actually in the same corner. Both have had their way of life forcibly changed by modern society. The perks for the orang asli include being able to get help from the Orang Asli Development Department (Jakoa). When we asked Jakoa district officer Razali Khamis if he know about the human-elephant conflict in his district, he said he had not received a single report. We then checked with the Perak State Parks Corporation (PSPC), which manages the Royal Belum State Park, and the result was the same. 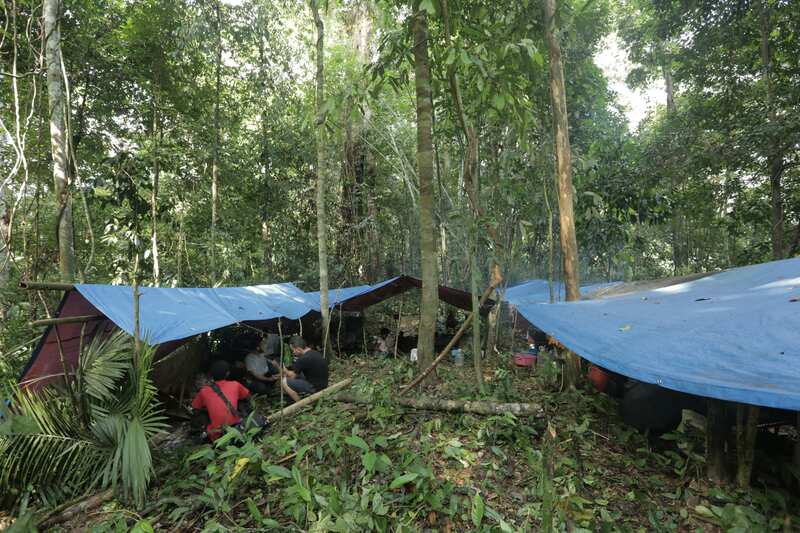 “There are very few cases because there aren’t any settlements in the area except for the small orang asli ones,” said Noor Ilyani Abd Rani, a PSPC administrative officer. She said matters involving animals within the state park were the responsibility of Perhilitan, and orang asli welfare is handled by other government agencies. PSPC will only assist them in the event of an emergency. We asked how often do they provide such assistance. She said she only has one recorded case. As was the case with our report on serawan, a common argument we heard was that the orang asli were not reporting these problems, so the authorities can’t possibly help. However, the R.AGE team sighted a management plan drafted by WWF Malaysia and the state park in 2011 which identified human-elephant conflict within the park as a “serious issue”. The plan also noted that translocated elephants were aggravating the problem. The plan was approved and adopted by the state park, so the issue is neither new nor unknown. But we played along with their little game of musical chairs, and approached Perhillitan. They said they’ve only received one report of human-elephant conflict. Sounds great, but there are two problems with that – the Jahai don’t have phones, and their village is two hours away by speedboat to the nearest jetty. From there, it’s another hour’s drive to the nearest town. Most Jahai people commute via bamboo rafts over short distances, making it impossible to lodge any reports of human-elephant conflicts at the district office. It’s naive to think that humans don’t have a space here. Universiti Malaya anthropologist Kamal Solhaimi Fadzil, who has conducted extensive research among orang asli communities in the Belum-Temenggor area, advocates a radical solution. “They should set up a joint task force, which includes representatives from the community, so one can deal with community issues such as human-animal conflict and livelihood issues, while the other deals with issues like poaching and illegal encroachment,” he said. The end goal of such a plan would be for the indigenous communities to play a prominent role in the conservation of their own land. “We should start to move towards a community-based model, where the community is trained to eventually take over park management duties because they are the real hosts, the earliest inhabitants and the people who know this landscape the best,” said Kamal. “There needs to be a social way, a discussion about these issues,” he added. In fact, the Jahai people have been in the Belum rainforests for generations. When their land was gazetted as a protected area in 2007, everything changed. Suddenly there were restrictions on what they could hunt, what they could gather, where they could farm, how they should behave. And now, they perceive the threat of elephants as originating from the actions of the authorities. Another man complained about park visitors: “When they come in, they look at me like I’m a bird. They never ask me for permission to pass.” The Jahai are territorial. They never cross tribal boundaries out of respect for their neighbouring tribes. 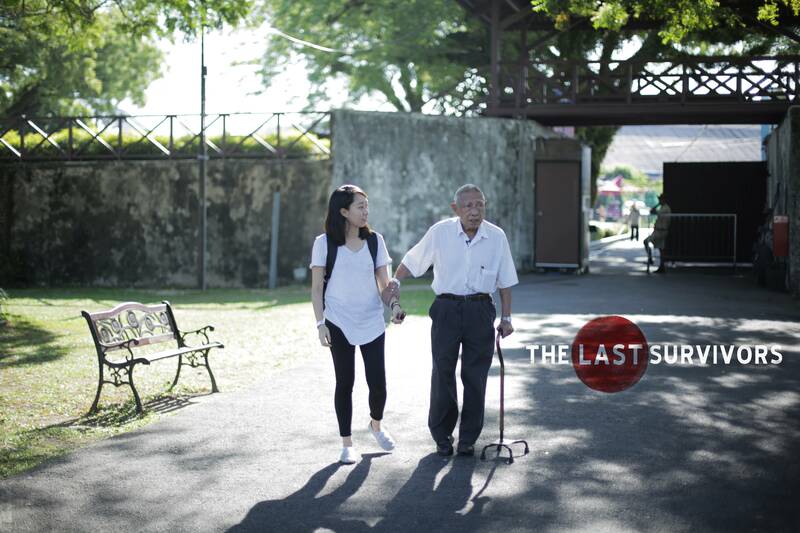 We interviewed the residents who live along the Sungai Kejar river, on 8 and 9 Sept 2015. Here’s what they have to say. A Masai boy invented a simple lighting system to scare the lion away. He said that it also keep other animals including elephant. Worth trying at the orang asli kampung in Belum? Thanks for the tip! We’ll definitely look into that for any follow-up pieces. I agree that we should allow them to take over the park management ! We can use their expertise so that wildlife and others can co-exist with minimal damage and so they are better protected in their natural habitat . Hello! I read this article on mongabay.com and thought of this incident. They uses bee hives to reduce conflict between the villagers and the elephants. I don’t know how applicable this can be for this case but just sharing in case it helps.